It seems like every time I'm working on a post a little more Macau-related, something comes up and derails it (stomach bug anyone?). Tonight Michael and the boys are having a three hour movie marathon with the intention of giving me time to write in peace. But right now there is anything but peace in my head or my heart. Can I just share that I'm really disliking Facebook right now? I already shared with you how just two weeks ago we lost Michael's Aunt Earlene. What I didn't share with you is how we found out about her passing: via a cousin's post on Facebook. I saw it first and told Michael personally before he opened Facebook and saw it himself. My Grandpa, the last day I saw him before he passed away. Shortly after we were married, I lost my last grandparent. Michael found out earlier in the day from my Mom, and instead of calling me at work, he made dinner and set out the nice china so when I walked through the door he was there to welcome me with a beautiful spread and open arms to tell me I was a girl who'd lost a generation of her family. It was so compassionate and the perfect example of the right way to give someone bad news (even if the meal goes uneaten). A great man died tonight, I was lucky to be able to call him uncle. He was on the team who created the first laser "big Bertha". He worked on so many awesome projects at NASA including the space shuttle and Hubble telescope. Because of him my science fair projects rocked. In his later years he joined the service of another kind, the Salvation Army, where everyone could see his heart of gold. I'll miss you uncle, I'll always think of you when I look at the stars in the heavens above. My cousin has other uncles that we do not share, but of course we do share one that worked in the aerospace industry and gave his life to serving others through the Salvation Army. I doubled over and moaned sorrowfully. Michael and the boys turned to see what was up and I said, "I think my Uncle Louie just died," and proceeded to burst into tears. I tried to confirm this by texting a few other cousins, my brother, and writing a message to the one who posted the status above. Of course, it was 1:00 a.m. in California, so fat chance of a response. But eventually someone did respond and it was confirmed. One exhausted cousin texted to say she would send an email in the morning with more details. I had to force myself to think from the perspective of people who were with my uncle tonight. I am certain the absolute last thing on their mind was to reach out and let everyone in the family know he'd passed. Losing a husband, a father? The pain must be so deep, and so personal. I can't pretend to imagine. And were it not for Facebook, I would have found out from the email my cousin will send after she wakes up. That would have been my preference of course. However, in the last few hours, which have been spent alternating between tears and silent contemplation, I've had to make peace with the fact that the days of being able to wait until someone is home from work to tell them bad news are over. Facebook, Twitter, text messaging- all instantly delivered into your hand. Good news or bad at your fingertips. To tie this all in to the expat life and make it relevent to this space, I can tell you that this has to be one of the most difficult aspects of living abroad. 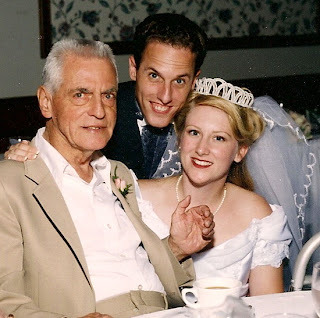 I've never missed a wedding, a baby shower, or a funeral for anyone in my family or my husband's family, even with all the international and domestic moves we've done in the last 15 years! But in the span of one month, we'll be missing two funerals for people who were very important to us. And even more difficult is the fact that both of these people lived in our former hometown, one a few blocks from our house, the other right around the corner from the boys' school. Had we not moved to Macau, I would have possibly had a chance to say goodbye to my Uncle. Ironically, the very last time I saw him, he was there to say goodbye to me. 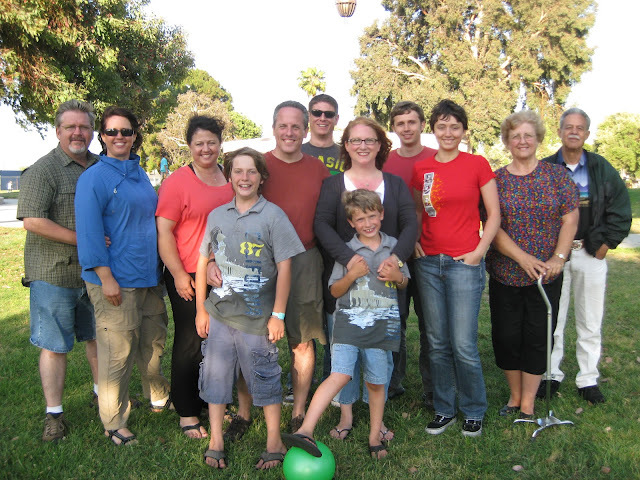 Here's a photo of my Dad's side of the family, at our going away party before we got on the plane for Macau. My Uncle Louie is on the far right. (My parents had already left). I have this habit that whenever I get together with family, I force us all to take a group shot. Sure, there's groaning, but they've come around. You never know when it might be the very last time you'll see someone. Here's what I want to say about my Uncle, and I wish I could tell it to you after I'd just cooked you a big meal and set the table with our finest china and crystal. My Uncle taught me how to grow the spiciest possible peppers for my fireproof tongue. He hated cheese and would happily pick me up a sack of tacos, but they were always dairy-free. He was an honest man, who made my Aunt fall for him because of that honesty. He never said no to my little brother and I, and his generosity to us was amazing, even more so now that I'm an adult and know first-hand how draining little children can be. He let me move in with him and my Aunt right after I graduated high school while I looked for a flat of my own, and he proudly introduced me as his niece to everyone he met, which made me feel very special. He had a heart-to-heart talk with me shortly after I was married which affected me so deeply I have to give him some credit for the fact that I'm still married nearly sixteen years later. When we made our first international move to Japan with our ten week-old baby, he had another heart-to-heart talk with me telling me how proud he was that I'd married such a great guy, and that I was a pretty great girl myself. He loved his grandchildren and great grandchildren so deeply that I think even his cells rearranged themselves into smiles when he was near them. And he had the most incredible heart for service- tireless service to the poor and downtrodden which knew no boundary, and asked for no acknowledgement or recognition. The world lost an irreplaceable man today. And when I think about it like that, it makes me want to post it on Facebook and tweet it to the whole world. So sorry for your loss Heather. Heaven shines a bit brighter with your uncle's presence. Praying for you and your family for peace and comfort. God gives comfort for those who mourn.